Have you ever heard someone complaining and when you question him about it, he says, “Well, I’m just telling the truth,”? It’s as if he feels that he has a moral obligation to use truth to complain about the state of the world. Some people seem to spend their whole lives standing at the complaint counter. 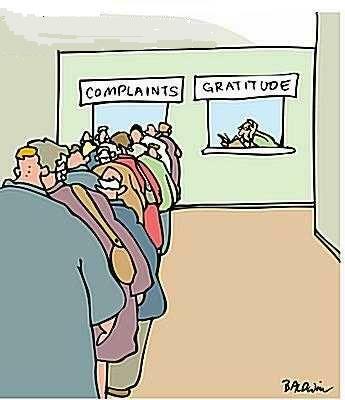 We live in a world full of complainers. As the world has gotten smaller through technology and travel, we have become more and more cynical and suspicious of everyone and everything. There are now more opportunities than ever before to take our complaining to a much larger scale and impact more and more people! There is a very simple reason for complaining. Here is the unstated motto resonating inside the mind of a complainer: “When I complain, I have a moment in my life where I don’t feel as bad about me because of how bad I make you look.” Complaining attempts to make something or someone look bad in order to make me feel better about myself. Complainers are notoriously self-focused. They are also notoriously miserable in life. My wife and I sat in a restaurant in St. Augustine, Florida, a few weeks ago and listened as a lady at the table adjacent to ours complained about everything from the weather to the way her dish was prepared to the type of water they served her. I truly can’t imagine that the woman has enjoyed anything in the past few years. The problem is: it is extraordinarily difficult to see my complaining nature in the mirror. If someone were to call you out on it chances are you would make every excuse in the world and maybe even look to blame someone else for your own complaining attitude. Here’s the “Jason” translation of that passage: “Stop your whining!” Instead, try something new. Do everything. Not some things. Not a few things. Do EVERYTHING without complaining or arguing. Why? Because God says when you do, you will be pure…blameless. People that don’t complain do shine like stars in the universe. And there is incredible joy and peace in that kind of living.